A major release of WordPress is due out later in 2018, WordPress 5.0, and with it comes Gutenberg, an all new publishing experience that will change the way you create posts and pages forever! To help you prepare, I’ve outlined some of the changes to expect with Gutenberg and how you can test it before the official release. 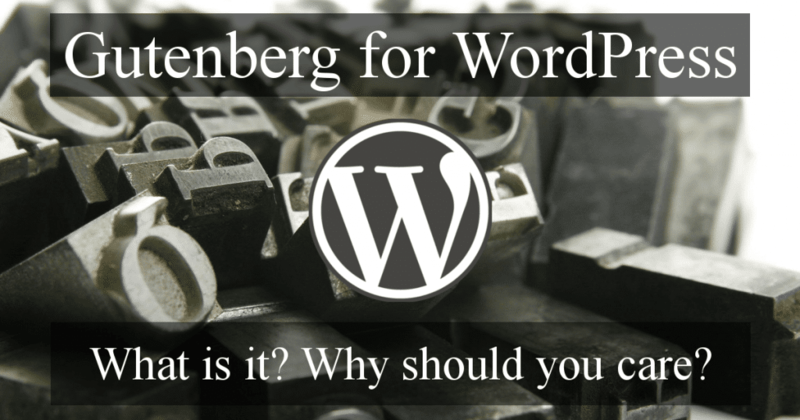 “Gutenberg” – the name of the project entrusted to create a new editor for WordPress. The goal; create a new post and page editing experience that makes it easy for anyone to create rich post layouts – Gutenberg Team. Gutenberg is named after Johannes Gutenberg, a German inventor who developed a printing press with movable type more than 500 years ago. So Why Change a Working Editor? If it’s not broken why change it? Others choose to forgo the current editor and turn to drag-n-drop Page Builder plugins like Thrive Architect, Divi and Beaver Builder etc. instead. Not my cup-of-tea, but each to their own. Well like most companies, Automattic needs growth to survive and that means attracting new users, in many cases, absolute beginners, to WordPress. The market is awash with website builders, and providers like Squarespace and Wix currently make the process of building a website easier (not necessarily better) than WordPress, especially for beginners. So for WordPress to maintain and improve on it’s considerable market share, it needs to attract new users and improve the web page building experience so they remain long term users. Say hello to Gutenberg for WordPress. It’s pretty clear that Automattic is banking on Gutenberg providing a much more flexible and intuitive drag-n-drop type editor so that users will no longer need to rely on third party plugins to provide this functionality, and thus enabling beginners to build sites with the ease of their competition. How Will the Changes Affect WordPress? In the first release (included in WordPress 5.0) Gutenberg will mainly consist of an update to the current editor, TinyMCE. However this is merely setting a new foundation that promises to revolutionise the ability to build custom sites in WordPress. Gutenberg for WordPress. What Exactly is it? Typically, Page Builder plugins provide you with blocks in a side menu. Each block represents content such as text, images, headings, tables etc. You can drag a chosen block into your page and then customise it’s settings. Your page is essentially a collection of these blocks that you can duplicate and drag around to achieve the look you’re after. Achieving the same result using TinyMCE often requires a solid grounding in HTML and CSS and quite possibly some complex shortcodes. In Gutenberg for WordPress, everything is a block! Enter Gutenberg and the introduction of blocks to the editing experience. It’s not a drag-n-drop page builder yet, although drag-n-drop is scheduled for inclusion at a later date, but it introduces the concept of using blocks as a means of producing media rich content. Embeds and so much more. Theoretically, you’ll be able to create all of your content, just as you wish, without knowing any code. 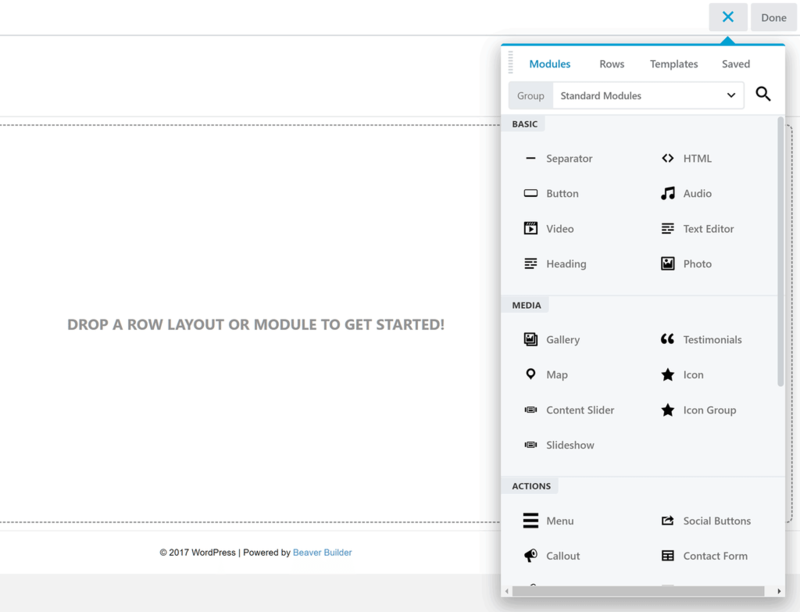 With the release of WordPress 4.9.8 on July 31st, you will see a new notice in your WordPress dashboard, inviting you to try-out and test the new editor, before it’s release later this year. 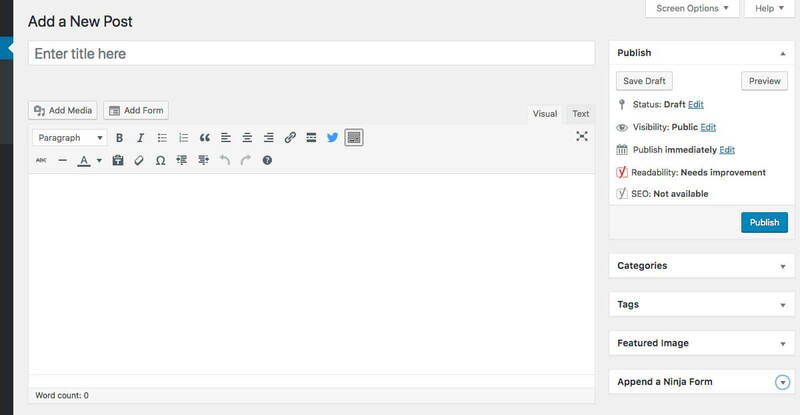 WordPress have released the new editor as a Plugin. You simply download the plugin, activate it and start trying it out. Activating Gutenberg for WordPress, introduces a new Draft Post titled Welcome to the Gutenberg Editor. This post features a number of blocks designed to showcase the editor. By clicking ‘Preview’ it will also give you an idea if there are any theme conflicts with the new editor. By all means test Gutenberg for WordPress on a Staging Site. NOT ON A LIVE SITE! For most sites, the new editor won’t impact your existing content, however it’s much safer to do all of your testing on a Staging Site. Depending on your theme, your site may need some tweaking in order to be completely compatible. Having said that the Test the new editor today. plugin option in WordPress 4.9.8 is a great opportunity to test and make sure that your site is ready for the change and to get acquainted with the new publishing tools. If you do find issues with your Theme/content and Gutenberg, or if you’re just not sure what the effects may be, you can download and install the Classic Editor. This allows you to safely update to WordPress 5.0 and keep using the previous editor until you can test and resolve any issues with Gutenberg. The Classic Editor has two modes, selectable in Settings / Writing. 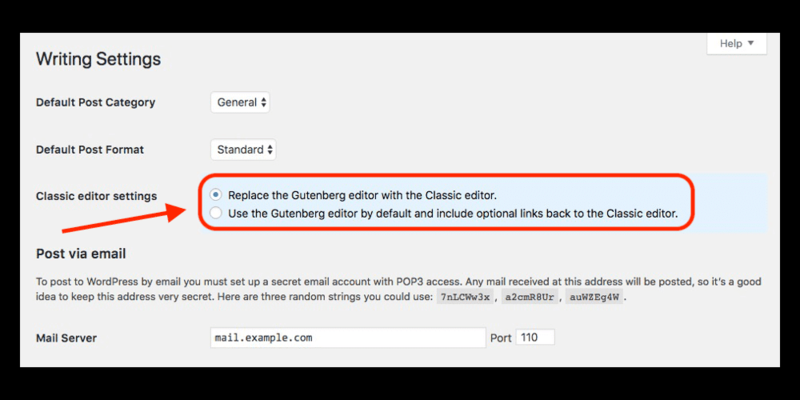 – This setting completely disables the Gutenberg Editor and is designed for those that need a little more time before making the switch. Without a doubt, Gutenberg is the biggest structural change to WordPress in over a decade and there will surely be growing pains. The jury’s out for me ATM. I’ve always liked the way that WordPress was lean-n-mean and to then use plugins to enhance functionality, if you needed it. Adding what is essentially a Page Builder into the core codebase may not be the best move forward. However, if offering a more visually interactive means to build sites, effectively brings the functionality of WordPress into line with the likes of Squarespace and Wix and continues the growth in global WordPress users. For new and experienced WordPress users alike, that’s surely a good thing. If you’d like some help testing your WordPress site in preparation for Gutenberg or setting up a Staging Site so that you can start testing it yourself; just click on the button below and drop me line, or give me a call. I’d be happy to help.